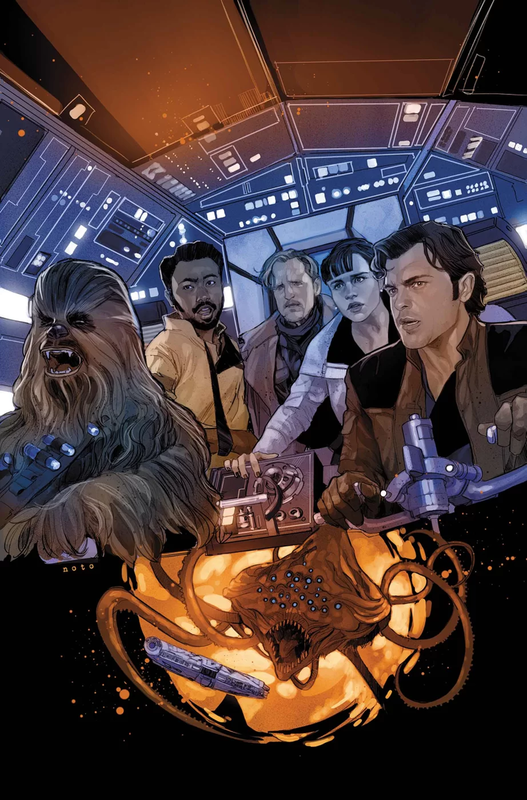 Surprisingly, I liked Solo: A Star Wars Story #5. I’m typically not a fan of comic adaptations, and I haven’t been much of a fan of this one, but this issue was pretty good. The artwork was on point and gorgeous, and the writing tossed in some extra stuff not seen in the movie. The issue opens with the Star Destroyer coming through the maelstrom tunnel and forcing the Falcon to turn tail and take a shortcut. Much of the scenes are just like the movie, but there’s a nice attention to the artwork with good details, likenesses, coloring and lighting. There’s some cool layouts, too, like a sidebar with a TIE chasing the Falcon or the symmetry with Han and Q’ira on Savareen talking about him being an outlaw. The bonus scene comes in during the maw chase when they get zapped by electricity and everyone’s hair stands on end, including Chewbacca. This was hinted at in the art book which had a concept art image of Chewbacca with his hair all standing up. It’s a funny moment and it’s nice to get something new. Overall, the artwork is solid. The only weak spot would be Beckett as Will Sliney still struggles with capturing the look of Woody Harrelson. The likenesses of everyone else, however, is really good. The story in this issue ends with the appearance of Enfys Nest on Savareen. It’s interesting as there are still two more issues left, so there’s plenty of room to finish up the battle with Dryden on Savareen and Han winning the Falcon in the end. I’m curious if we’ll see some more bonus content. With some new content and great artwork, I give Solo: A Star Wars Story #5 a four out of five metal bikinis.